What do you need to cook traditional American pancakes for your breakfast? Main ingredients are flour, eggs, milk, banana, apple, bilberries, raisins, sugar, syrup, butter and salt. 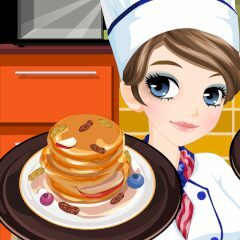 Follow chef's advice and enjoy yummy pancakes!